Whether you’re a competitive athlete or a weekend warrior, soreness, pain and injury can quickly derail your efforts to reach your fullest potential. So when sports injuries happen, your goal is to heal quickly, safely, and get back to the top of your game with an eye toward preventing future injuries. That’s our goal, as well, at Next Generation Physical Therapy. 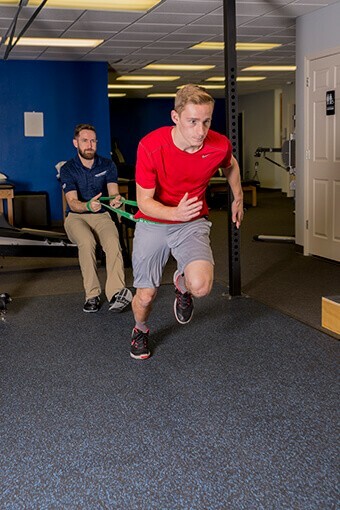 A physical therapist will work to restore you to the competitive and fitness level you enjoyed prior to your injury. Contact us to schedule a thorough assessment to determine the source of your injury, treatment options, and what you can do to prevent future issues. As a Gym owner it’s so valuable to have a good DPT in your back pocket! Jacob has yet to let me down. When issues come up that are beyond my scope, I refer my athletes to Next Generation! If at all possible, I go with them. What I respect most about Jacob is that he makes it a priority to teach you how to correct your issue yourself. Time and time again he has left my referral open without a follow up appointment booked. He’s more interested in getting you back on the field with an enthusiastic referral than having you come back to tag your insurance repeatedly. If something is bothering you, or if you need to recover faster…book an appointment with these guys!!! You don’t need a referral.